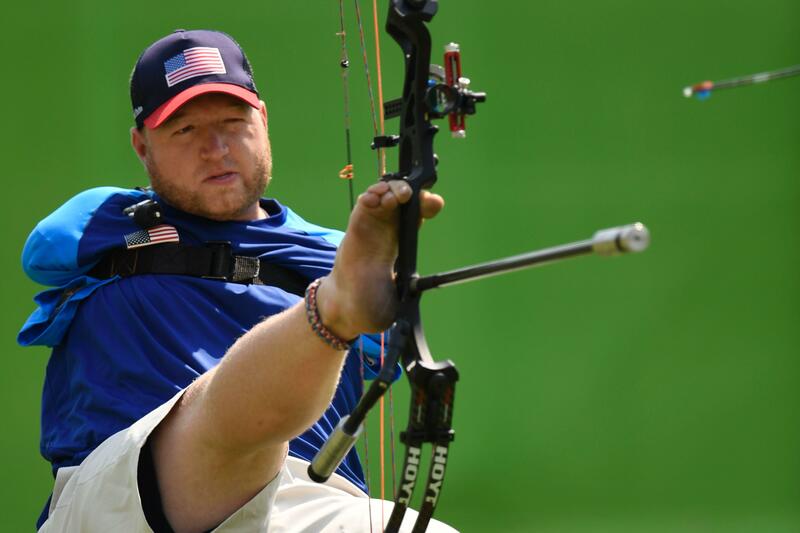 RIO DE JANEIRO Matt Stutzman was born with no arms - just stumps at the shoulders - but he says there’s almost nothing he can’t do. He holds a world record for the most accurate distance shot in archery, which includes able-bodied archers. He drives a car without modifications - right foot on the steering wheel - plays basketball, and can write with both feet, both shoulders, and his mouth. He shaves and feeds himself with his feet, and his house in southeastern Iowa has no modifications of any kind. Stutzman - known widely as the “Armless Archer” - has gone from being a depressed, unemployed stay-at-home father in 2009, to being famous and well-off. He won a silver medal in the 2012 Paralympics in London, and is a favorite to win a medal in Rio. Along the way he’s accumulated sponsors like British Petroleum, Nike and many others. Along with plenty of determination, Stutzman also has a keen sense of humor. He likes to recount awkward moments about shaking hands - with a man who has no arms. At the Pan American Games a year ago in Toronto, the medal presenter reached to grab Stutzman’s shoulder to congratulate him. Stutzman often greets people this way. As he did, Stutzman, instead, offered his foot. Or the time in 2009 when he searched on Google for tips about archery. Stutzman was adopted at 13 months by Leon and Jean Stutzman. He said his parents would always let him try things first, never jumping in immediately to help. “I had to learn how to adapt to the world, instead of the world adapting to me,” he said, recounting hours when he and his father would toss around an imaginary baseball. Stutzman holds the bow with his right foot, extends his leg and braces the blunt end of the arrow against his shoulder. He triggers the shot with jaw and back muscles. That’s his general attitude. Just find a way, and get out of my way. Stutzman, who lives in the small town of Fairfield, Iowa, has developed a cult following. Fans screamed his name on Wednesday during his competition at Rio’s famous Sambadrome, many clamoring for a photo with him. Americans Joe Lin and Kiratiana Freelon called him over for selfies. Lin worked as an Olympic volunteer and Freelon works for the Rio organizing committee. Stutzman still can’t believe the following that fame has given him.